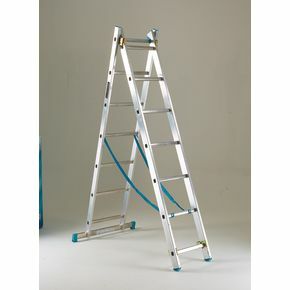 If you spend a lot of your time working off the ground at height, you need a reliable ladder to aid you in your work. Our heavy duty two section transformable aluminium ladders provide you with a strong, yet lightweight construction which makes them easy to transport. A wide stabiliser base is there for extra stability, ensuring that you are well balanced while working - they are also fitted with slip-resistant rubber free and rungs to help prevent accidents from happening. 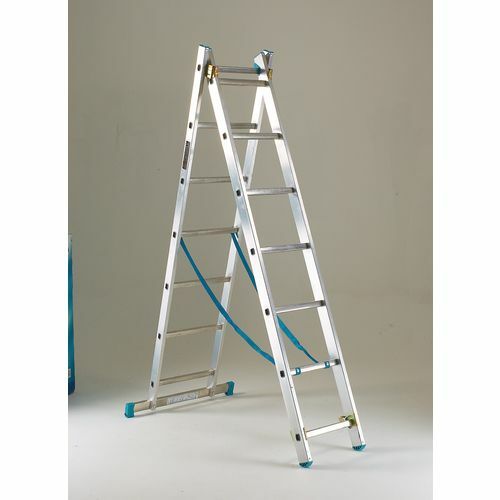 This product can be used as a step ladder or as a two section extension ladder, giving you flexibility with its use to work at different heights safely. The maximum capacity with these products is 130kg and they are available in four extended heights; 3.4m, 4.24m, 4.8m and 5.92m. We are confident that you will find our ladders a useful tool for your business - they have 36 months guarantee and FREE Next Day UK Delivery.